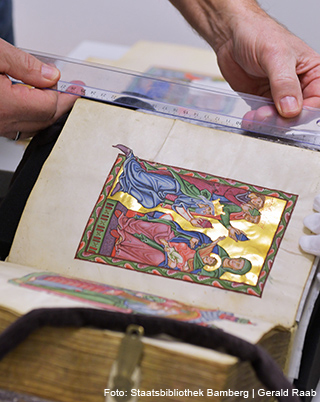 The Bamberg Psalter shimmers with gold, warmth and promise. The gilded miniatures on the front and back covers shine through thin plates of horn on the binding, which are attached with delicate silver mouldings. Inside the gold sparkles, and the colours of the miniatures and initials glow like stained-glass windows in the sunlight. The contents and the binding form a complete unity. Here we truly have fireworks from Late Romanesque book art! The Bamberg Psalter, which dates from around 1230, is the result of a perfect collaboration between two artistically outstanding masters of the illuminated manuscript who belonged to different traditions, and whose juxtaposition and coexistence documents the stylistic change from the Romanesque to the Gothic. They show themselves as being open to the new currents, and it is charming to discover how their light-flooded images fuse older stylistic forms with new ones. Another harmonious unity is formed by the exclusive horn binding and the radiant golden paintings of the manuscript. 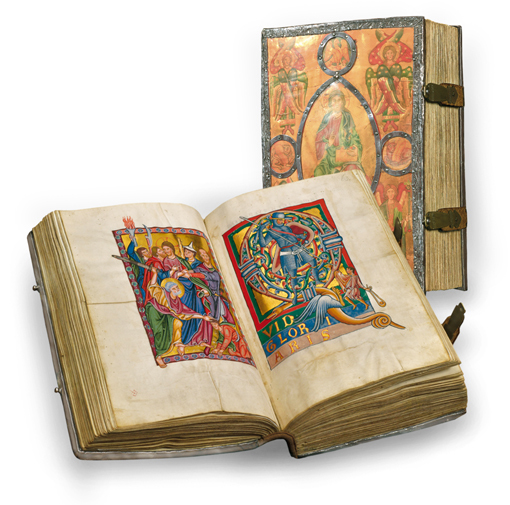 This is because the motifs of the miniatures relating to Christ and the Virgin Mary beneath the horn plates on the binding complete the three pictorial cycles inside the Bamberg Psalter. The lavishly decorated illuminated pages of the Bamberg Psalter captivate the viewer just as much as its eye-catching cover. The main decoration consists of fifteen full-page miniatures with scenes from the New Testament in three cycles of five miniatures each. There are also eight full-page entwined gold initials that divide the Psalter into eight liturgical sections. By contrast, three pages of colourful initials emphasise the openings of Psalm 1, Psalm 51 and Psalm 100, and thereby highlight the tripartite division of the book that was commonly used since the days of the Church Fathers. All the 150 psalms begin with a multi-line gold initial on a colourful ground; the verses always start on a new line with an initial, also of gold. The question of who commissioned the Bamberg Psalter can no longer be answered. It is indisputable that the Psalter was intended for the private devotions of a high-ranking figure. Lavish psalters were often associated with aristocratic ladies. 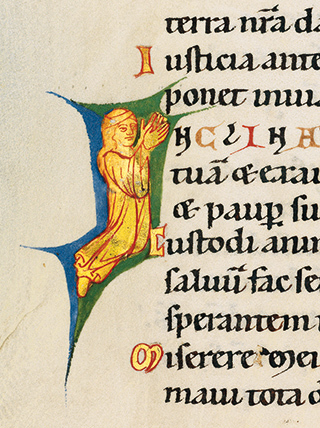 The figurative initial “I” at the beginning of Psalm 86 depicts a woman praying in gold on a blue-and-green ground (fol. 99v). That could be read as a reference to the patroness of the manuscript. In the calendar (fol. 3v), the murder of Count Gebhard von Hirschberg (d. 1245) is indicated on the 5th of June, and this provides material for speculation about the familial origins of the patroness. Her precise relationship to the knight on fol. 135v remains her secret, however. Two master illuminators produced the Bamberg Psalter: a distinctive primary master with stylistic roots in the Late Romanesque art of around 1200 and a younger illuminator with clear influences from northern France and from the then nascent Zackenstil (jagged style) as harbingers of the Gothic. The work of the primary master is dominated by miniatures with very large figures of slender proportions. Their faces have highly rounded chins and large, almond-shaped eyes. One characteristic feature of his style is the design of the drapery of the garments, which lends plasticity to the figures. An example of this is the fact that, unlike his colleague, the primary master wraps each of his figures in garments of lavish fabric that gently descend in round folds. The undulating garments and pleated fabrics suggest movement and thus reinforce the dynamics of the image. 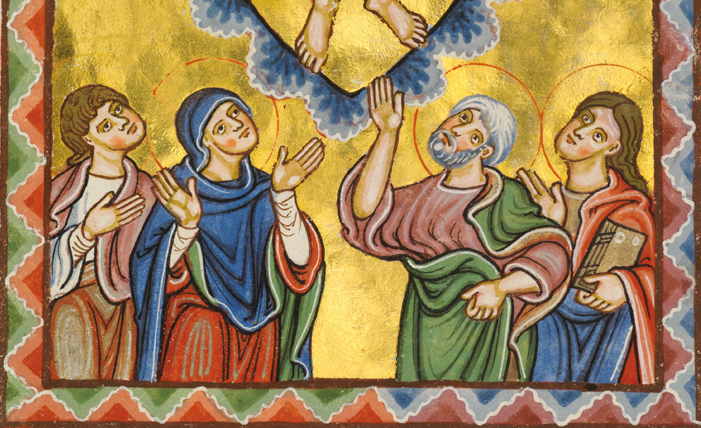 One impressive example of the primary master’s painting style is the miniature on fol. 60v, which depicts the Wedding at Cana (John 2.1–11). Christ is sitting at the centre of the table, with the Virgin to his right and the groom as host on the opposite side. In the foreground stand six stone water jugs, which are intended for ritual purification and are being filled with water by a servant at Jesus’ request. 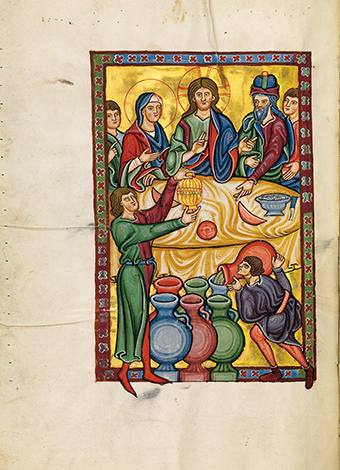 A second servant, whose foot extends out of the frame on the left, is pouring the water that has become wine into a gold goblet with a lid. His garment of two colours is a detail borrowed from contemporary fashion. The Bamberg Psalter is fascinating for the splendid colour of its illuminations. Every page, as well as its cover, seems to have been dipped in gold light. 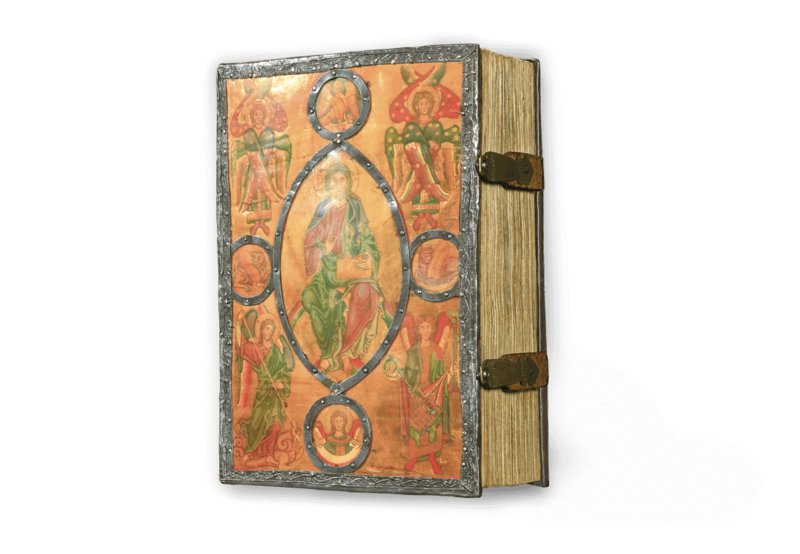 The contemporary horn-plate binding is a great rarity, and its faithful reproduction turns this facsimile edition of the most beautiful German manuscript psalter of the thirteenth century into something unique. This facsimile edition has been published under the great patronage of the Most Reverend Dr. Ludwig Schick, Archbishop of Bamberg. The excerpt from the Bamberg Psalter chosen to be leafed through here reproduces the sequence of fols. 6r–10v. It features the last two pages of the calendar, the months of November and December (fols. 6r–v); the first five-page cycle of miniatures with scenes from the childhood of Christ (fols. 7v–9v: The Annunciation to the Virgin, the Birth of Christ, the Adoration of the Magi, the Presentation in the Temple, and the Baptism of Christ) as well as the opening of Psalm 1 with its decorative initial B (fol. 10r) and the page of text that follows it (fol. 10v). 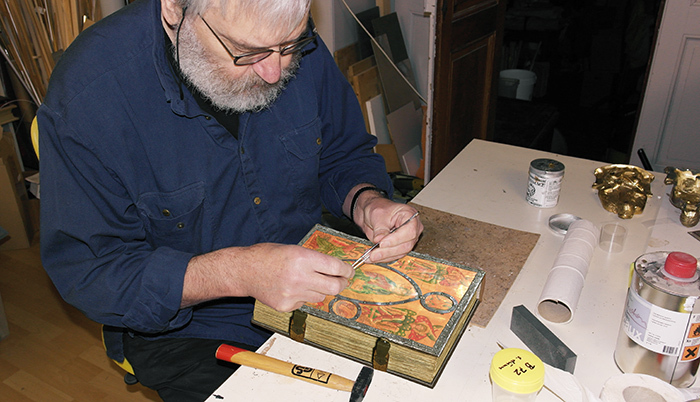 When producing the facsimile of the Bamberg Psalter, the reproduction of the horn-plate binding represented a particular challenge. 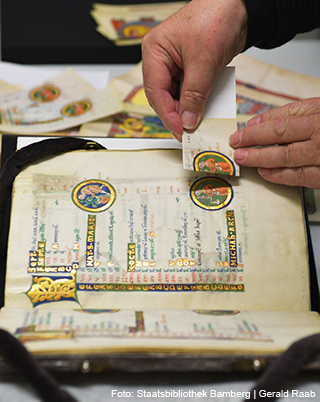 Mastering it required many years of experience with facsimiles. It was especially demanding, for example, to harmonise it with the colours of the gilded miniatures on the front and back covers, which shine through the delicate plates of horn. A special technique was developed to replicate the two horn-plate covers to reproduce the plates in a faithful and lifelike way. The chased silver mouldings were reproduced with the same care. All of the work on the binding was a collaboration of the best specialists. The rich manuscript illumination of the Bamberg Psalters fascinates the viewer thanks to the generous use of gold and precious pigments. Their faithful reproduction required all the skill and long experience of the lithographer and printer. The gold in the miniatures, medallions and initials, which is uniquely sparkling and dazzling, was reproduced with the aid of a special technique. The original also makes occasional use of silver, and it likewise looks more or less oxidised on the facsimile. Proofs of all the pages were compared with those of the original on location, corrected, reprinted, and then re-checked again, until final approval for printing was granted. 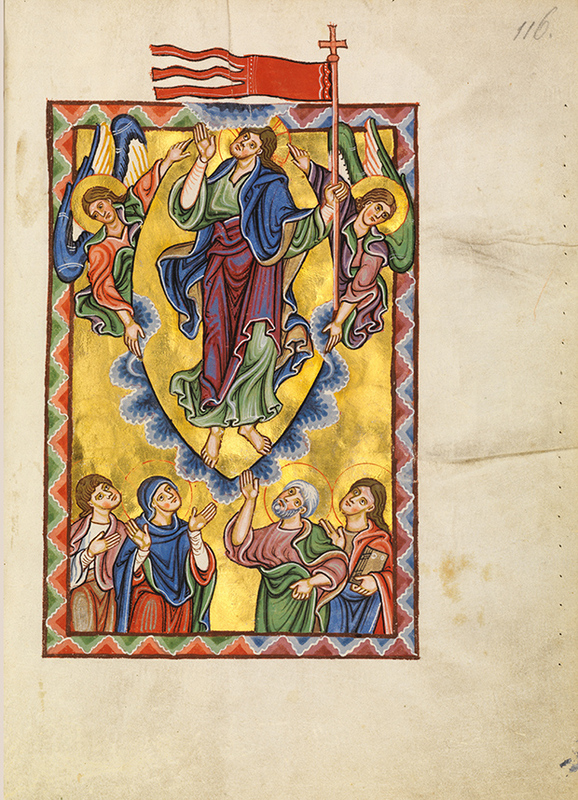 The facsimile folder for the Bamberg Psalter contains an original double-page spread from the facsimile (fols. 9–10). It features two full-page miniatures on a gold ground (The Presentation in the Temple and The Baptism of Christ), a page with a decorative initial with the beginning of Psalm 1, and a page of text with various gold initials. It will give you an exemplary first impression of this unique and splendid manuscript. 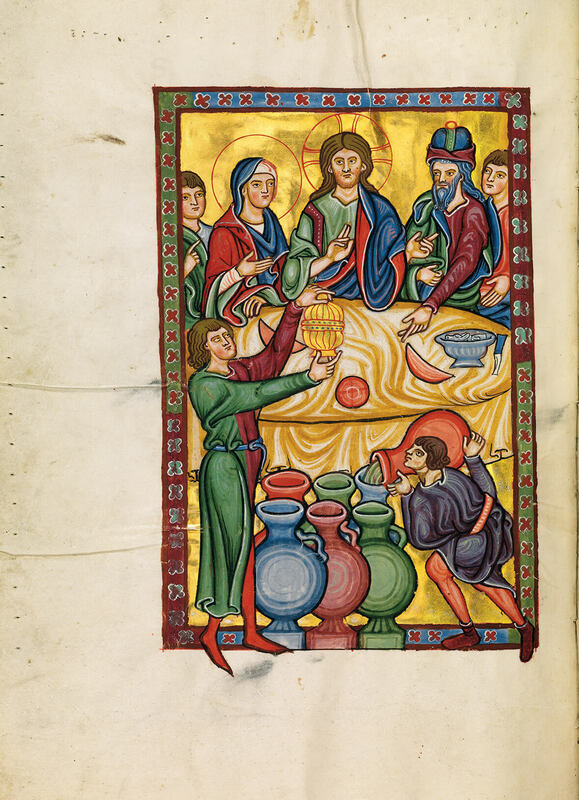 A documentation brochure offers an introduction to the period of its making and to the magnificent decoration of the Psalter, which has supposedly been in Bamberg for eight hundred years. The brochure also schools the eye for a style of manuscript illumination that is transitioning from the Romanesque to the Gothic, and reveals the stylistic characteristics of the two illustrators involved. The binding of horn plate, which dates from the early thirteenth century and is extremely rare, is explained in detail and, for the first time ever, is reproduced as part of the facsimile. 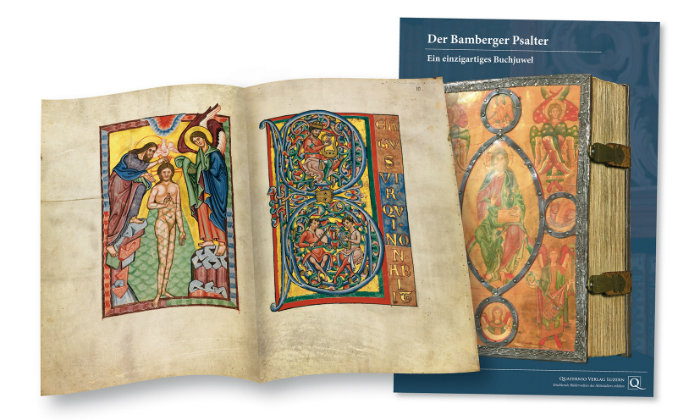 Click here to go to the online shop (only available in German) where you can order the facsimile folder for the Bamberg Psalter edition. Or send us an email to info@quaternio.ch. 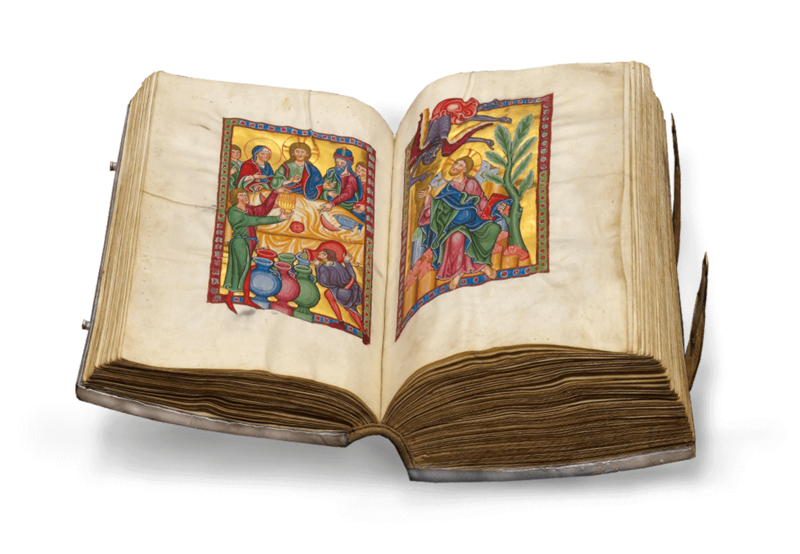 We would be glad to provide you with additional information regarding the fine art facsimile edition of the Bamberg Psalter. Click here to order the brochure.